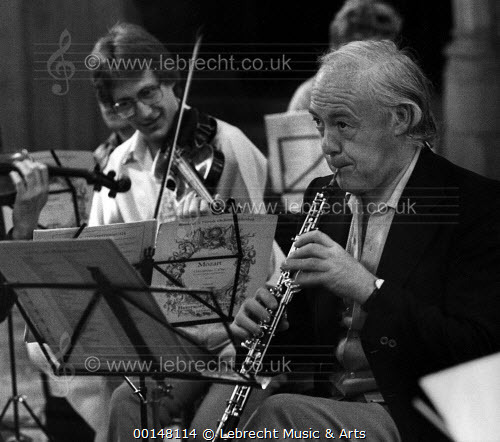 We have been informed by friends who visited him this month that Neil Black, principal oboe of four London orchestras, has died at the age of 84. Neil was successively principal of the London Philharmonic, Academy of St Martin in the Fields, English Chamber Orchestra and the London Mozart Players. 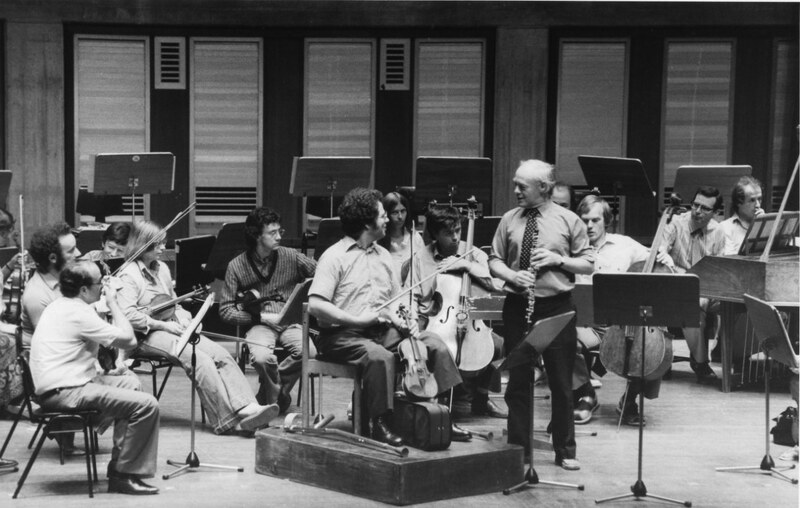 By our reckoning, he appeared on more big-label recordings than any other oboist. In Neil’s heyday, Neville Marriner made more records with the Academy than any other conductor-orchestra pairing except Karajan with Berlin, and the London Philharmonic were effectively house orchestra for EMI Classics. Birmingham born, Neil played from 1948-51 in the newborn National Youth Orchestra before reading history at Oxford University. He never intended to be a professional musician, but by the late 1950s he was London’s go-to oboist, showered with engagements and concerto dates. Conductors of every type, modern or period, asked for him by name, and he never let them down. He was a quiet authority at the heart of London’s orchestras. Very sad! I loved working with Neil. A perfect gentleman on and off the stage. Saddened to hear this, RIP Neil Black, a great exponent of the oboe and a formative influence on us all. Mein herzliches Beileid der Verwandtschaft – ein trauriger Tag. Very sad indeed. I grew up listening to his recordings and had the pleasure of finally meeting him in 2009. A true gentleman. He will be missed. Absolutely echo the above comments. Neil was a gentleman to his fingertips, always unfailingly courteous to his colleagues, a very dear man. His playing was superbly stylish in whatever style of music he found himself engaged in be it Baroque or Blockbuster film. My condolences to his wife. I am so sorry to hear this. Terrific player and an absolute gent. Such an honor to have known and made music with him. Only a few years ago he joined my local amateur orchestra in a performance of Act 1 of Die Walkure, where he was quite happy to play third oboe. Had a lovely chat with him and he signed my LP copy of his recording of the Strauss concerto with the rather endearing comment: “with thanks for keeping this antique so long”. Very happy to reminisce about the recording sessions (ECO/Daniel Barenboim) which apparently were somewhat fraught as Barenboim had just been involved in a car accident but insisted on the sessions still going ahead. Still sounds great after 40 years. Very sad to hear this news. Neil was a lovely man who taught me a lot about style (I hope it shows). But he was also a good friend. We played the St Matthew Passion together many times with the ECO and the Bach Choir. Lovely memories. Best wishes to Jan. He was a beloved faculty member of the Sarasota Music Festival for many years until the 2016 season when he was ill He and his wife were lovely and gracious additions to the Sarasota music community during the three-week festival and will be sorely missed. He had the most marvelous sound. His coupling with Elly Ameling in Bach’s cantata 202 – with Marriner (ridiculously unavailable on CD) – is stunning.. The entrance of the oboe with a gradual crescendo is breathtaking. Indeed it is, a real symbiosis. You might like to know that It is available but only as part of an Elly Ameling ‘Icons’ boxed set, I have the set and it’s full of treasures. And the recording is available on Spotify. I am listening to it as I write. Wonderful playing and singing. Neil was a true true gentleman. Forever courteous and his playing reflected his personality perfectly. Quiet, dignified and encouraging. An unfailingly courteous colleague and a true musician. He was particularly helpful to me when I first worked with the LMP in 1970, and his playing of the Italian GIrl in Algiers was spellbinding in the concert. A man of rare talent and unfailing kindness. My memory may be at fault, but didn’t he play at John Culshaw’s memorial concert? . Neil was a close friend of my mentor, Raymond Oboe Weaver (dec’d) through Lady and Sir John Barbarolli (Ray played under Sir John, Houston Symphony). Ray admired and respected Neil above many other greats, for his lyricism and ethic. We all aspire to achieve such a lofty position amongst our peers. A wonderful musician and such a good friend, He was a huge influence for good in the music profession. Very sorry indeed to hear this sad news, a wonderful player and gentleman and he will be greatly missed. I have just heard this very sad news. I was very fortunate to study with Neil at RAM. He was the first person I had studied with who completely inspired me into working hard and was a lovely friend and player. He was such good fun and very entertaining company on top of being such a wonderful musician.